A black and white negative of a passport photograph of Mrs. Mabel James. The negative envelope indicates that the photograph was taken on May 3. No specific year was given. Mrs. Mabel (Bosley) James was born in 1907. She married Frederick George James and they had two children: Mary and Phyllis Mary. 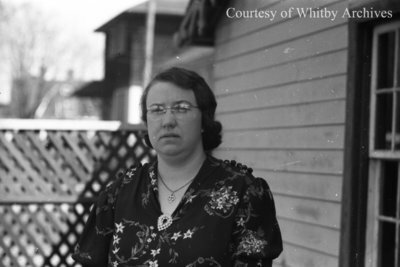 Mrs. James died on 16 November 1989 in Whitby, Ontario. Mabel James, c.1939, Marjorie Ruddy. Whitby Archives A2013_040_715A.